Disclosure: This post was sponsored by Depend as part of an Influencer Activation for Influence Central. I received complimentary products to facilitate my review. For more information, please refer to the disclosure that can be found at the bottom of this post. As a mother, it doesn't take long to discover how demanding it really is in every possible way---emotionally and physically. Constantly running around and getting things done, both literally and figuratively. But having children certainly can take a toll on our bodies. If you experience stress urinary incontinence, you aren't alone. 1 in 3 women in the US live with bladder leakage every day. Common causes of SUI include pregnancy and childbirth. I don't ever recall anyone mentioning that possibility to me when informing me of the types of things I should be expecting post-baby! Having to live with bladder leakage is bad enough, it's even more frustrating when there isn't a sensible solution to manage it in your every day life. That is, until now. The Depend Silhouette Active Fit briefs are everything you've been waiting for and more. These great new briefs are made of a cloth-like fabric that offers comfort, convenience, and sits smoothly under your clothes. They provide a reliable, quality option for women who experience moderate leakage and want to manage it with confidence. The Depend Silhouette Active Fit briefs even look like regular underwear! I've met and have known many women over the years who are affected and live with bladder leakage. They were embarrassed not only to be living with SUI, but also uncomfortable talking about it and how it affected them. Not one of them had found a way to live their lives without allowing their bladder leakage to limit their participation in physical activities. I'm so glad I now have a wonderful product to recommend to any woman I meet that experiences stress urinary incontinence to help them live more confidently and freely. 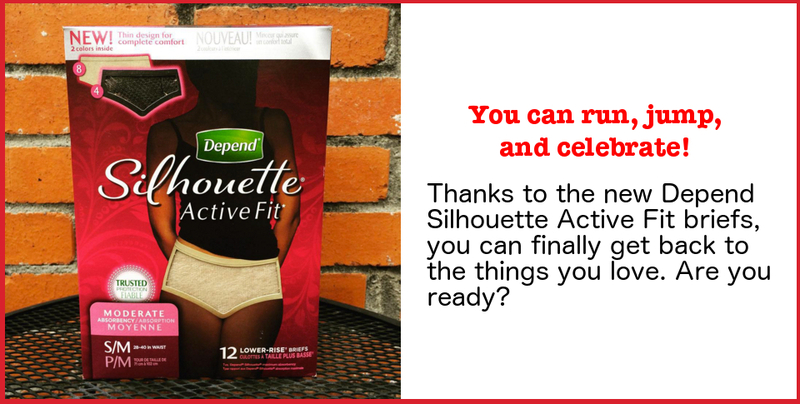 Look for Depend Silhouette Active Fit briefs at a store near you. You can also get a coupon to use on your next purchase of Depend Silhouette Active! Depend is also doing great things to help break the stigma surrounding bladder leakage with the #Underwareness Campaign. Depend will donate $1, up to $3 million, for every photo or video shared using #Underwareness through 2016 to fund charities that research and educate about bladder leakage. Each box of Depend Silhouette Active Fit briefs contains 12 lower-rise briefs. With the Depend Silhouette Active Fit briefs, you'll be ready to enjoy the physical activities you enjoy, both great and small. Disclosure: This is a sponsored post. I received product to facilitate this content. All opinions expressed are my own, and were in no way influenced by the brand or any other sources. The post and all photos with the watermark are the property of Found Frolicking, and should not be used or distributed in any way without first receiving permission. Found Frolicking is in no way responsible for prize shipment, but will work with the sponsors in all ways possible to ensure the winner receives their prizes. SO many people need these for so many reasons. I know a teen who uses them because of something done to her in her past. I'm glad there are products out there for her. I will keep this in mind in case I need it or a friend tells me they need something like this. Such a common problem for woman. It's great to see this out here for woman that need it. Am glad these are available for people who need them. I love that they're trying to break the stigma with those who have this problem. I can say I'd buy that if that was my issue for sure. I've always heard this product and some of my friends had been used this,they say that this is awesome and perfect for those having a problem with bladder leakage. once menopause hit, this became a problem I don't want to say this post was helpful, because them I'm admitting to something that I don't want to admit to. But if I admit to anything I'd say that this was a great post. This is really nice. I love that women have something to rely on. It's definitely going to help a lot of us. Wow I'd not heard of Silhouette before. I'm going to share this with my wife. I will have to check these out. There are some moments that I think these would make easier. Thankfully I don't have leakage issues but I'm so glad there is something out there for those who do. These sound great! I really love that they are making these more like underwear and less like diapers! I don't have the need for them at this time, but the option doesn't seem as "old-lady-ish" as it used to!